US Mexico border wall latest burning issue in USA. US-Mexico border length is approximately 2000 mile. The problem is that at certain places on US Mexico border proper fencing is not done. So, it’s impact many illegal immigrants come to US. Trump’s call for a border wall became frequent in 2015 before election. Europe was going from sensitive issue of Refugee crisis. Millions of people from Africa, Syria were coming to Europe. Some of the refugee fall in crime. Media of Europe covered the crime of Refugee highly. The broadcast of media reached to USA. So, it became perspective to avoid entry of middle east refugee in USA. We know that, Trump said I will ban Muslim in US before election. Pressing on these patriotic issue Trump defeated Hillary Clinton in 2016. The continental border between the U.S. and Mexico which stretches for approximately 2,000 miles. California, New Mexico and Texas. 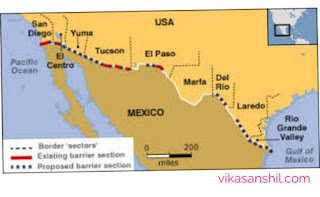 The entire border between U.S. and Mexico which extends from the Gulf of Mexico to the Pacific Ocean. A United States Department of Homeland Security report says that 170,000 people successfully illegally migrated. the U.S. illegally migrants are from the southern border in 2015. Report says that approximately 5.6 million “unauthorized immigrants” from Mexico by 2016 year. It is according to data from the Pew Research Center. In all There were 10.7 million unauthorized immigrants in the U.S. in 2016 from world. It represent 3.3% of the total U.S. population that year. A rising share of illigeal immigrants have lived in the U.S. They lived for more than a decade. About 2/3rd (66%) of unauthorized immigrant are adults in 2016 had been living in the U.S. US has Better standard of living than Mexico. Better wages are in US than Mexico. Mannual works Mexican people do in agriculture, as US people prefer service sector. American farmers get people in farm on cheap price to do work from Mexican. 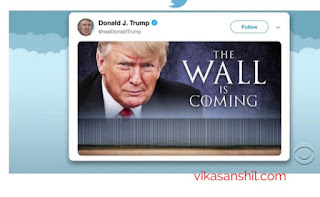 Throughout his 2016 presidential election campaign, Donald Trump called for the construction of a much larger and fortified border wall, claiming that if elected. He would “build the US Mexico border wall and make Mexico pay for the dollar. But Mexico condemned it and said will not come under US pressure. In 2020 US has presidential election and to please his party supporter it became important to Trump. In January 2017, President of Mexico Enrique Peña Nieto said his country would not pay for the US Mexico Border wall. government to start attempting to construct a border. wall using existing federal funding, although in reality construction of a wall did not begin at this time. Recently, Trump administration wants Congress to approve $5 billion for the project. But, Democrats Party are offering only $1.3 for border security wall. for his border wall issue by the Congress. He also threatened to call a national emergency if not approved and urged to build the wall fast. Even though the legality of such a step is not certain. U.S Congress has not set any limits to it. Congress has not provided any definition of national emergency or required condition for the president to make any showing. The U.S wall can be an excuse for the Trump administration to impose an emergency and abuse the power. Although this move can be challenged in the court of US. The President will still be the one in complete control. and set a very bad example to them. So, It is the comprehensive analysis on US Mexico Border wall which is current hot topic. If you have any questions you can comment. Italy’s Competition Authority fines Facebook for Selling users Data. May be the related towards the same topic and flow well when read together.